What was once a proud and storied college gridiron battle between Pac-10 foes, Washington Huskies and Washington State Cougars, the annual, end-of-the-year matchup known as the Apple Cup, has now deteriorated into the infamous Crapple Cup. The Crapple Cup game will be Coach Ty Willingham’s swan song, as he has been forced to resign his position after the season ends. You can more about my feelings about Coach Willingham here. Apart from its regular Top 25 ranking of the “best” college football teams in the USA, ESPN also takes a shot at the worst college football teams – The Bottom 10. For the week of Nov. 18, take a wild guess who are ranked at the top of this distinguished list? 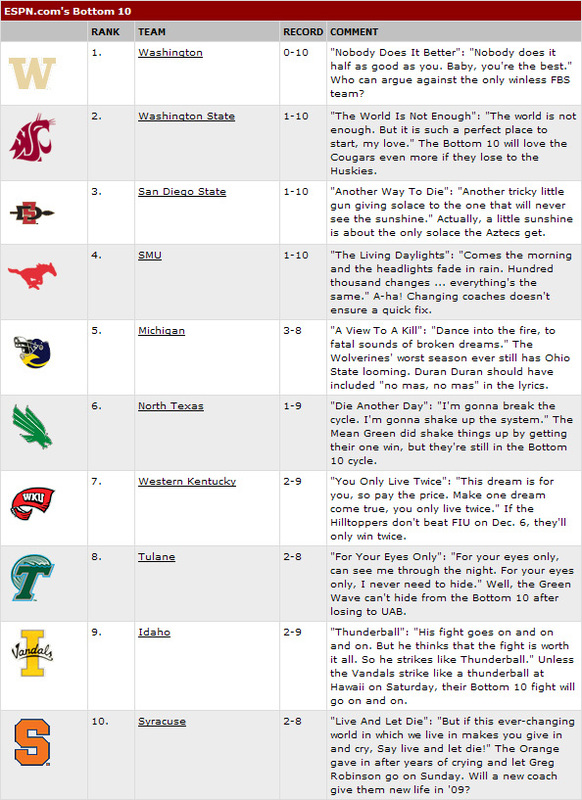 None other than UDub ranked as #1 with an 0-10 record, followed by WSU at #2, with an 1-10 record. So basically, the Crapple Cup game will determine the worst college football team in 2008. See the chart below for the rankings of the remaining worst teams in America. Surprisingly, Michigan makes an appearance on this chart, which must be very painful for the Wolverine faithful. Note also the funny upside down Michigan helmet logo. Ouch! To see the complete Bottom 10 chart with commentary, click here.